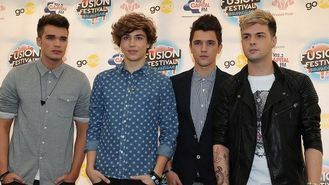 The boy band originally auditioned for The X Factor as three-piece Triple J, but original members Josh Cuthbert, JJ Hamblett and Jaymi Hensley welcomed solo auditionee George after the show's judges recommended they team up and change their name. But in a mishap on the way back from the US, George stepped on some glass at LA airport and had to have stitches in the bottom of his foot, which later burst and had to be redone. Due to perform in Chesterfield, he tweeted: "I'm so sorry but we are going to have to cancel the gig today. While we were in LA I stepped on glass at the airport and have ended up having to have stitches along the bottom of my foot. "Last night they started bleeding quite a lot so I'm having to go back to the hospital to get them looked at. I will keep you updated and promise I will make it up to you." But when Triple J started trending on Twitter, the concert was back on - minus George. The comeback of Triple J, even though short-lived, divided fans with some delighted that the original line-up was back, while others were sad to miss out on seeing George. Josh stuck up for his bandmate, tweeting: "Trust me when I say this. George wouldn't miss a show unless he had to, none of us want to ever let you guys down. Ever." He later tweeted: "Everyone chill please. Don't believe everything you hear/read. We will be coming to Chesterfield and performing as a 3 jeeeeeeeeez x." JJ confirmed: "Guys as Queen said "The Show Must Go On" Unfortunately George is Unwell and we wish him a speedy recovery. But the 3 of us will be there."